This is a "complete" meal, as it has the right balance of natural carbs, healthy fat, and protein! Feel free to add more veggies! Mushrooms, bell peppers, and onions all go well in this dish. 1. To make the sauce, add the drained beans, garlic, almond milk, and 1 tablespoon olive oil to the pitcher of a blender. Puree, blending for about a minute until completely smooth. Taste and add salt and pepper, if desired. 2. 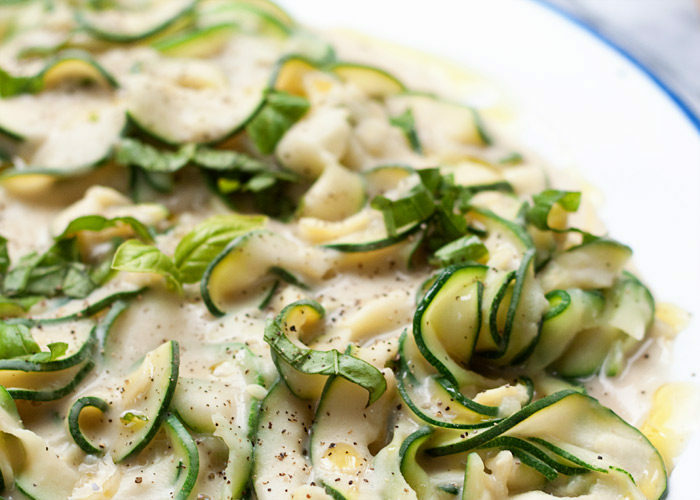 Using a spiralizer, cut the zucchini into ribbons. Place a large sauté pan over medium-high heat. Add 1 tablespoon olive oil and a pinch of salt. When hot, add the zucchini. Saute, stirring occasionally, until tender, about 2-3 minutes. 3. Pour the sauce over the top. Cook, stirring occasionally, about 2 more minutes. 4. Top with basil and serve.